I've heard so much about this book, but the blurb never really grabbed me - however I really liked the intro! I wanted to know what happens when this couple finally arrives. Will be interested to hear your thoughts. 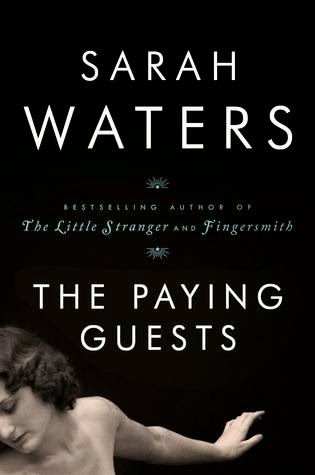 Sarah - I've like some of Waters' books better than others, but this one if off to a strong start. Sounds interesting. I am staying away from most historical novels these days unless they are mysteries. I have had my full for this year and may begin again next year. Hope you like it. Harvee - I think there may be a mystery involved with this one... it's quite long, so I haven;t gotten to it yet. Nice choice. I am planning to read this one--it's been on my shelf for a while now. Enjoy! Catherine - I haven't been disappointed by Waters yet! Paulita - I was fully invest after reading the first 60 pages, but I love the audio narration, too. I downloaded this one to Sparky a few weeks ago...and can't wait to read it! Love that intro...and from what I've heard, this is a truly engaging read. Thanks for sharing...and for visiting my blog. Laurel-Rain Snow - It has definitely pulled me in! Have a feeling you'll like this one, too. This one sounds interesting. I've read a few post-WWI books recently, but so far all have been set in the US, so this will be different. Kim - Post WWII London is a favorite setting for me. The intro is nice, but it doesn't grab me. I'm going to see what else Juliet Stevenson has narrated. Any suggestions? Vasilly - Most recently, I loved Stevenson's narration of The Signature of all Things by Elizabeth Gilbert. Another favorite was Trespass by Rose Tremain. She has helped me through many classics, too. Literary Feline - I'm hoping this turns out to be a page-turner like Fingersmith! I'm fascinated by this era, and I'm sure I would enjoy this book. The author did a great job in the opening of showing the woman's anticipation and mounting nervousness. I'd keep reading to find out how the lodgers changed her life. Sandra - I love this time period, too. Waters is such a good writer! This looks excellent. I will look forward to your review! Monica - So far it's wonderful. I'm hoping the combination of print and audio will help me get through this long book quickly. Yayyy! I hope you love it! Andi - Thumbs up so far! I hate it when people are late... and then you end up feeling so guilty when they have a genuine excuse. Chippy - It really is a good read... and I hate being late! I've been really wanting to read this one. I love the intro. I hate that feeling when you're waiting for someone to arrive or waiting to leave. She does a great job with the description. I have been meaning to pick this one up. Now I will. It sounds promising. Oh yes, read-on. I loved this one. I definitely would continue and want to read more of this book. I would listen to anything Juliet narrates! I also have not read anything by Sarah Waters, but I like the intro, the setting and the time period. I'm glad to hear the audio version is so captivating. I like the premise, though I confess I found the opening paragraph a bit choppy and hence not the easiest to read. Hope it's good--I will check back to see how you like it. Love this opening. How come there's never enough time to read everything we want to read? Like this opening. Would definitely want to continue reading. Fasten your seat belt, JoAnn! This book is on our list for my book club this month! Well next month, November. I hope it's a good one. Sounds like it. Les - Juliet Stevenson does an excellent job with the audio, but I think Fingersmith may still be my favorite Waters novel. Yay for making time fly! This is an author I know I need to get to sooner rahter than later. Oh wait, it already is later! Stacy- Fingersmith is my favorite so far.